December 7-13 2015, presentation of You look like me at the Animateka festival, Ljubljana, Slovenia. November 27 2015, presented by The Animation Summits, the performance Rolling over Blinkity Blank with Andrea Martignoni, Cinémathèque québécoise, Montreal. October 31 – November 5 2015, presented by the Festival du cinéma international en Abitibi-Témiscamingue, the video installation Berlin – The Passage of Time, conference and screening of You look like me. October 15 2015, 17:00, performance with Carol Rieussec, LUFF LUFF (Lausanne Underground Film and Music Festival). October 14 2015, 16:30, conference (Archives, found footage, internet sources, uncertain limits in an infinite space) during the colloqium Uses of the Archives : From Sources to Practices organized by the University of Lausanne and Udine in collaboration with the Swiss Cinematheque. October 14-16 2015, the video installation Cycling Utrecht (Places and Monuments 7)presented at the colloqium Uses of the Archives : From Sources to Practices organized by the University of Lausanne and Udine in collaboration with the Swiss Cinematheque. October 7-18 2015, presentation of the video installation Cycling Utrecht (Places and Monuments 7) as part of FNC Lab, Festival of New Cinema, at the Agora des sciences de l’UQAM, in Montreal. September 16-20 2015, You look like me selected in the non-narrative competition, Ottawa 2015 International Animation Festival. September 1 to 6 2015, presentation of the live animation performance Rolling over Blinkity Blank (Digital Scratch) with Andrea Martignoni at the International Animation Film Festival «Nikozi», in Georgia. July 14 – August 7 2015, You look like me selected at the Fantasia Festival, Montreal. June 24-28 2015, You look like me selected in the Extremely short films non-competitive section at the 8th International Animation Festival Fest Anca, Zilina, Slovakia. June 15 to 20 2015, You look like me in official competition (Off Limit), Festival international du film d’animation d’Annecy. June 12 to 14 2015, presentation of the video installation Berlin – The Passage of Time at the “48 heures Chrono” festival, Friche de la belle de mai, Marseille. June 1 to 10 2015, shooting from André Bazin’s screenplay about the roman churches of Saintonge in France (Places and Monuments-8). May 29 2015, 21:30 at the Stadtkino im Kunstlerhaus, screening of You look like me in official competition in the Animation Avant-Garde section of the Vienna Independent Shorts Festival, Vienna, Austria. March 18 to July 5 2015, presentation of the Cycling Utrecht (Places and Monuments 7) video installation at the Holland Animation Film Fetival and in different locations in the city of in Utrecht, Nederland. March 18 to 23 2015, You look like me in official competition at the Holland Animation Film Festival, Utrecht, Nederland. June 1st to 10 2015, shooting from André Bazin’s screenplay about the roman churches of Saintonge (Places and Monuments-8). June 12 to 14 2015, presentation of the video installation Berlin – The Passage of Time at the 48 heures festival, Friche La belle de mai, Marseille. 15 au 20 juin 2015, You look like me en compétition officielle Off Limit, Festival international du film d’animation d’Annecy. March 7 and 8 2015, conference and performance at the Under the Radar Symposium organised by ASIFA Austria in Vienna. February 1st and March 31 2015, presentation of the Berlin – The Passage of Time video installation in the exhibition space of ASIFA Austria at MuseumQuartier in Vienna. February 19 to 22 2015, presentation of a program of films Norman McLaren/Pierre Hébert at the Animac festival in Lleida and at the Centre de Cultura Contemporània de Barcelona (CCCB), also presentation of the video installation Berlin – The Passage of Time at the CCCB. 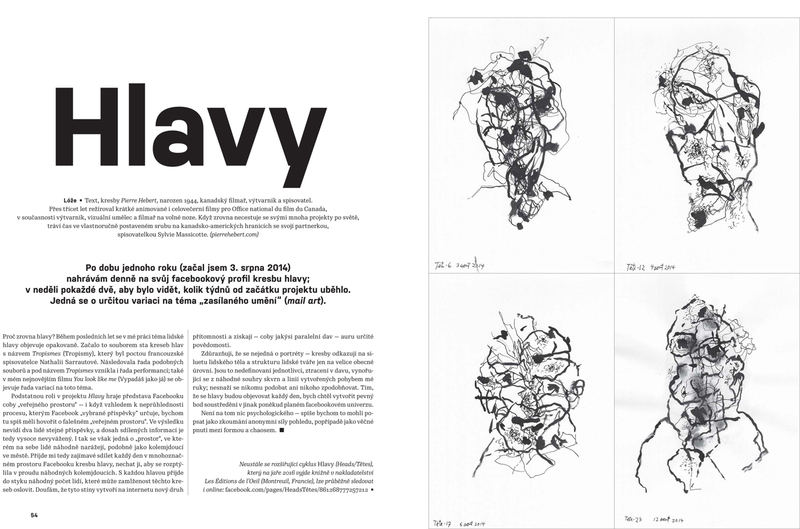 February, The Czech cultural magazine RozRazi (no 53/54) just published a series of 25 drawings of the «Heads» series as part of a thematic issue about identity. January 15 to March 29 2015, the video installation Berlin – The Passage of Time presented at the Goethe Institut of Montreal, on three screens in the windows of the Institut, visible from the streets at night time. January 5 to 31 2015, invited filmmaker to hold a blog on the web site of the film magazine 24 images.